On a hot September day I was away with a group of students painting ‘en plein air’ in a local town’s shaded corner, a typical French setting. 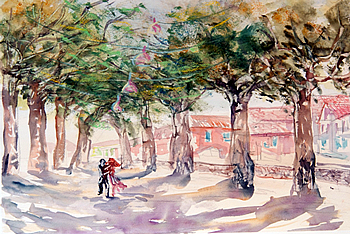 I was about to give a demonstration in watercolour of a promenade when a young couple, embracing each other, walked into the scene and created a whole new reading of the scene with light, shadows and leaves arching and almost dancing with them. 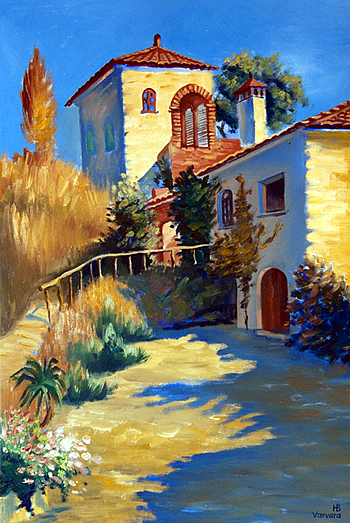 I used wet-on-wet technique, opting for colour first and employing a razorblade to consolidate painting with structural drawing lines upon washes depicting brush strokes chasing each other. 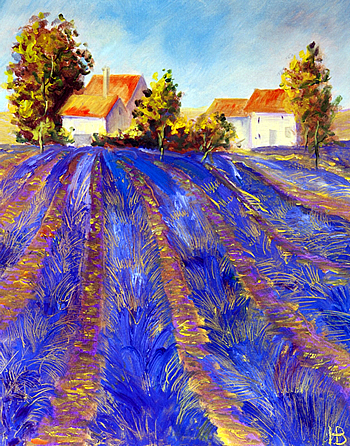 During one of my painting holidays in the South of France, I was completely taken by the experience and mesmerised by the beauty of the pattern of a Lavender field, overwhelmed by its smell and followed by listening to a faint sound of chanson from the nearby house. As I was on my way back to the studio after a painting session with fellow students I had a set of acrylics and a blank canvas I decided to stop there and then and paint from this spot. I hope that my artistic interpretation will evoke similar sensation and feelings towards the place as it did for me. A few years ago I was taking students on a painting holiday to Carcassonne in the South of France. One day after successful sketching and whilst waiting for the bus to take us back to the studio we were resting on the benches in the shadows of an ancient wall along the boulevard. 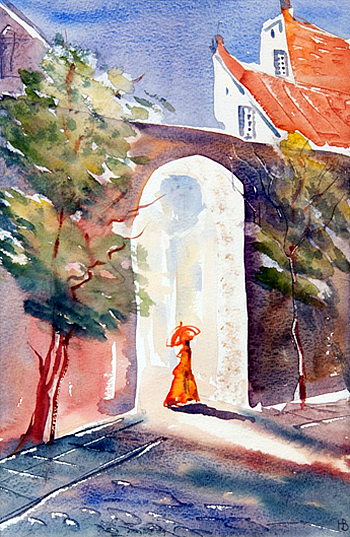 Suddenly a woman in an amazing orange dress with matching parasol passed through the archway. This fleeting moment made a picture and was commemorated in watercolour wet on wet. Students were happy to have this unexpected demonstration and I was also pleased to achieve the feeling of a very hot day by using contrasting temperature colours in a free impressionistic style. This oil painting was created in my Beaconsfield studio when back home in the UK after a painting holiday. I had a preparatory sketch in watercolour which developed into an oil painting as I wanted to achieve real depth of tonal values and rich textures unique with this medium. I hope that when you are viewing this image you will be also be taken by the feeling of wanting to be there in the sunshine in this quiet beauty spot. As well as en plein air painting, her other genres include portraiture and life drawing, moving figures in watercolour -- and her acclaimed cityscapes, capturing fleeting moments. Varvara has been a popular and inspiring teacher for many years. As well as her extensive experience she also has a Postgraduate Certificate of Education (PGCE). She is skilled in oils, acrylics and watercolours and will teach in any of those mediums, depending on the preferences of individual learners. (Water-based oils for easier transportation.) During her course there will be group demonstrations as well as one-to-one guidance based on observation of work in progress. . Varvara likes to create a friendly atmosphere in the group, encouraging students to share their experiences and actively participating in ‘peer critique'.